After ten years of experimentation and artistic expression as a professional woodworker, John Lindsay joined forces with his friend and mentor, Alessandro Paradiso. They commenced ten months of focused design and made a discovery that has defined the last ten years of John’s life (tons of tens), developing a singular series he calls PetalPly. After the initial group of products consisting of a chair and a variety of tables were created, John Lindsay taped into his nearly two decades experience with custom cabinetry and millwork, and hit the ground running with sub-series two (casework). The initial product was a desk that established the language for the rest of the sub-series. The main innovation was with the relationship between the super structure, the legs and arms tied together with a continuous dowel that served both a structural stretcher and a three way through tenon. With tops made of 1inch solid material, this with the super structure offers the needed strength to hold in suspension thin skinned cabinetry. Next, was the decision to have the cabinets share the exact same parts and construction methods as the drawer boxes, using half inch solid material everywhere with tongue and groove joinery. This universalization of the parts allows for dedicated machines ready to handle any demand, greatly simplifying the process of component part manufacturing. The cabinet edges have one inch half round face-frames with coped joints that visually match the tops, while leaving the necessary inside space for concealed hardware. This is needed for the handles to also serve as running slides running on concealed cleats. The final touch, the jewelry of the whole ensemble is the inventive handle that runs horizontally, wrapping along the sides doing double duty as the slides. These three eight inch dowels dado into a eighth inch aluminum bar which is then dadoed into the drawer face and sides. Speaking the same language as the larger structural dowel toward the back and the one inch half round edging, this elegant solution can be used in multiple handle configurations, and becomes another signature feature in the PetalPly vernacular. The same aluminum flat stock that is used in the handles/slides is also placed into the lower file drawer as file hangers. Expressing the horizontal with both the super structure’s two inch dowel and the continuous handles is a Mid-west tradition. Developing sub-series one and two, working in interesting penetrations, was all about breaking from the norm. Next for New Breed was to see if the PetalPly system could apply to more conventional tops. Kid A sub-series explores rectilinear solid wood slabs with straight edges and a trestle type base that can support detachable file cabinets. Here we get out of the way of the beauty of the wood tops and find expression in the base, with an upside down triangular connector that is sandwiched (ply) between two spreading legs. 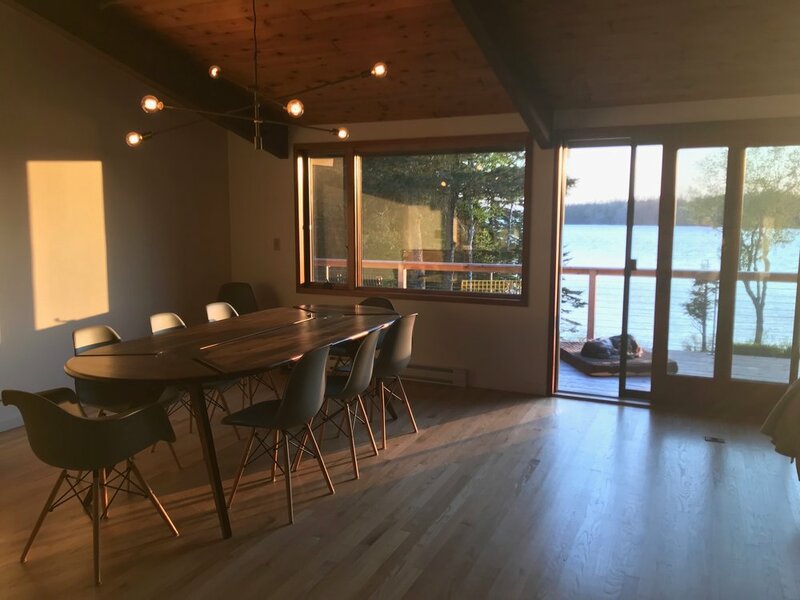 Sometimes the legs are spread equally (see Kid A Conference Tables), and other times they shift asymmetrically (see Kid A Desk). The point of the second approach is to move the dowel/stretcher to one side to allow enough room for a cabinet to attach, making the table a desk. These same tables can be put together in pairs to make a perfect conference table. Again, developing sub-series one and two, working with all solid wood and solid wood joinery, was all about making heirloom a feature. The idea is that if everything is made of solid wood, each piece can be endlessly refinished, meaning that each piece can be made brand new anytime. This goal steered us away from the use of veneers, hidden substrates, and mechanical fasteners. Next, we wanted to see if heirloom could benefit by the use of mechanical fasteners, controlling for wood movement while also doing the work of holding flat tops by using long bolts, washers, and nuts made to go through the upside down triangulated connectors, and metal strapping dadoed into the tops. This mechanical solution allows for both seasonal movement of the wood tops, while offering the option to move the leg assemblies to a number of different positions. This option allows for a number of configurations for both desk and conference table applications. Developing the cabinets for all of sub-series two, working with thin cabinet components, was all about suspended cabinets off super structures. Next was the challenge of designing a cabinet that could be used independently, strong enough to support its own weight, and endure the pounding of a free standing cabinet. These cabinets are multi-purpose objects, attachable to the long dowels, and made to slide left or right, allowing different seating configurations. They can also be detached from the desk and used as a separate work top. This desk was originally designed for commercial applications and included a family of accessories such as cork faced privacy panels, electrical grommets, attachable shelves and lighting elements. Also, a mobile base for the cabinets is an optional. A new direction has been taken, coupling an advanced version of earlier experiments in wood tectonics (see cubis cabinetry) with a base which is a variation on the Kid A sub-series. In short, the original experiment was to re-saw, edge glue, surface sand, and panel press solid wood using all yellow glue onto a stable wood veneer substrate, thus stabilizing the solid wood while allowing various sized and shaped panels. These tops use quarter inch solid wood pressed on one side of an equally thin substrate. The whole structure is wrapping torsion ribbing which is generously glued, and pressed to the engineered panels with a whole new technique, creating stunning triangulated objects. Normally some kind of caul and batten system with pneumatic or pipe clamps is used to press the panels together. Instead, measured out 1/8inch holes are predrilled, removable mini battens are custom cut and predrilled to correspond with the pre-drilled holes in the panels, which are corresponding with the inner torsion ribbing. Basically, these panels will be able to be pressed accurately and flat to a skeletal structure using nothing more than small pieces of scrap sized lumber, long screws with wide heads, and an electric drill. No need for larger space demanding cauls and battens, pipe clamps, and added bench space. 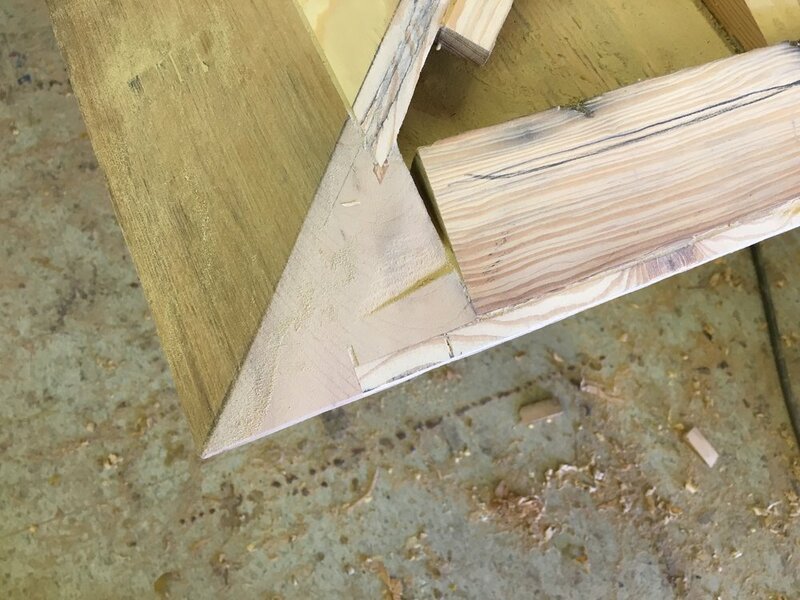 Combine this with long milled solid wood edges and corners that are exactly shaped to allow for wide glue surfaces for the panels to be pressed onto. The result is a triangular top that can handle long and wide spans while being impossibly light thanks to its hollow core construction. The triangulated edges are elegant and aesthetically powerful. These triangulated forms saddle perfectly onto a unique take on the traditional trestle base, with a long spanning dowel that reduces wracking by mortising through four sets of double thick supports (petal legs and arms). 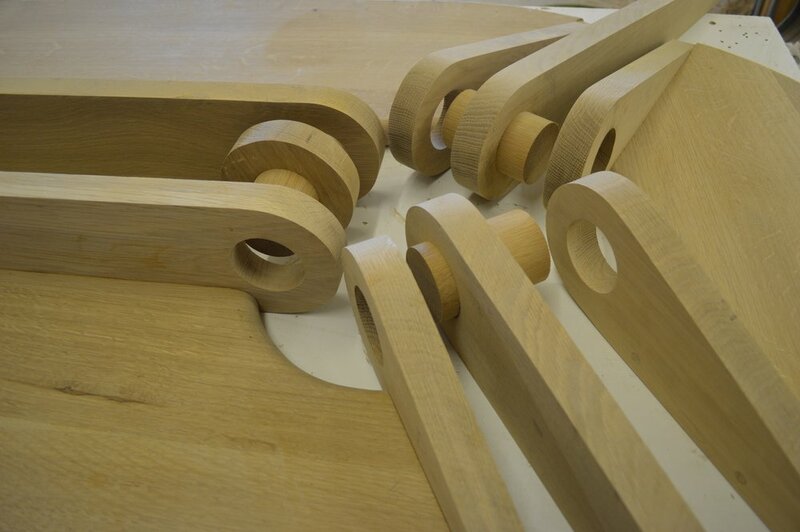 Because of these double thick petals and legs, the dowel/stretcher is down sized from the two and a half inch dowel, used for the Kid A tables, to the two inch dowels found in the Sub-Series Two desks. The original petal-ply super structure approach, found in sub-series two, has all independent parts (petals) such as separate legs, and usually an arm making up a three layer ply rotating around a dowel that serves as a trestle like stretcher and a super strong mortise and tenon joint. The Pong sub-series combines legs with a half lap joint, and extends the arm in both directions from the central dowel/stretcher. However, rather than two horizontal members sandwiching a leg, here we have two horizontal members shuffling two legs, beefing up the strength of the long legs while adding a new visual feature. This table features the longest cantilever in our collection, making it one of the most dramatic designs we offer. The original Pong product, which gave the sub-series its name, started as a challenge, to design a dual purpose conference/work table and a ping pong table all in one, with a removable net. To do this the legs were moved toward the center to allow for seating on all four sides. Also, the dowel extends out past the legs to fit into outer arms that have extra ribbing for cantilevering support. The removable net is customized with half inch solid wood sandwiched on both sides to help the clips meld into the larger form. In minutes the owner can go from work to play, and back again. Our use of veneer core plywood (never mdf or mdf core plywood) is a best practice here, being that we pride ourselves on specializing on heirloom quality. Sometimes rules are meant to be broken. For this application, the veneer plywood works best for long spans, painted finishes, and lowered costs. Combining an off white pigmented polyurethane with the clear American black walnut makes these tables unique in our collection. The color used can be made to match any color palette for any room. Solid walnut is inlayed and taped off for the center line necessary for doubles. Combining a simple storage grid made of fourteen inch by fourteen inch units, perfect for vinyl record storage, with asymmetrical stereo component storage in the center, and finally a waving or undulating facade. Undulas is both a practical and highly sculptural system. Like the Sub-Series Two cabinets, all the parts are made of half inch material, with one inch half round solid wood edging that is registered into the panel edges with a dado spline method. 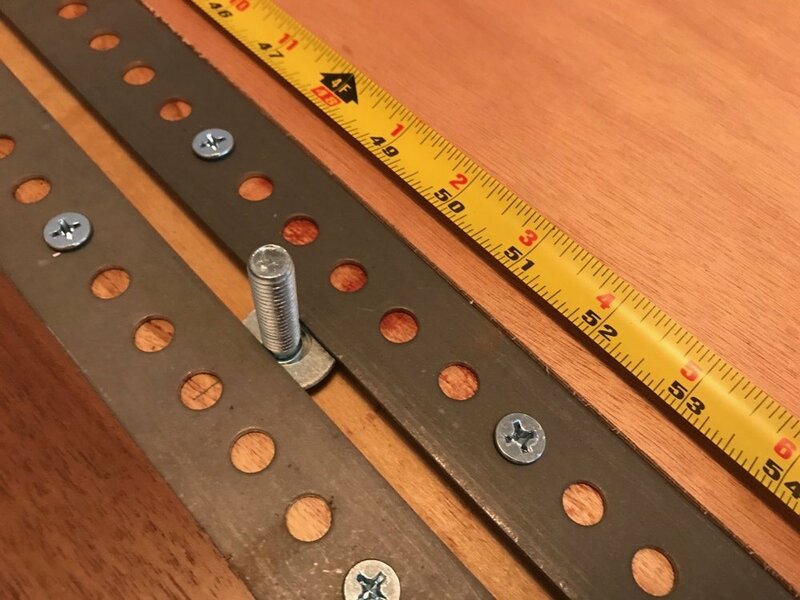 The horizontal panels are pre-drilled for both quarter inch registering dowels and pilot holes for inch and a half screws, which makes assembly hassle free. Larger assemblies are delivered in sub-assembly sections that fit together with the half round front edging expertly copped. Undulas was designed with the cost savings and logistics in mind. Both light weight and easy to assemble is the experience to expect. By starting with a full wall design, one hundred and thirty-six inches wide by ninety-one inches tall, subsequent products are available by cropping different sections from the original form. This universalizes the production process, lowering costs. Having numerous options lets buyers choose the right sized unit for their specific needs. Also, separate sections can be acquired at different times to allow buyers to accumulate larger assemblies over time.